Stop reading right now if you haven’t seen Game of Thrones season 8 episode 1, because this feature is all about spoilers. Spoilers to do with Game of Thrones dragons, characters, and things that happened in the premiere to season 8. Still here? Good! We have tons of Game of Thrones season 8 episode 1 questions as there were a few scenes that weren’t quite explained, whether deliberately or not. 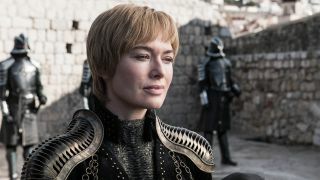 This first episode has surely set up some major story beats for Game of Thrones’ last season, and although a couple were blink-and-you’ll-miss-it moments we’ve gathered all of the important bits below. From this point onwards we’ll be talking about major spoilers for the first episode, so scroll past the image of a miffed Daenerys to see the Game of Thrones season 8 episode 1 questions we have! 1. Why did Drogon give Jon *that* look? That moment where Daenerys kissed Jon in front of her precious dragons was adorable, but Drogon’s reaction was… strange. Dogs get over-protective of their owners sometimes, and that one exchange between Drogon and Jon could imply that the giant dragon isn’t altogether happy that his mum has a new boyfriend, especially as Drogon is kind of a metaphorical reincarnation of Khal Drogo, having been born from his death and retaining the Khal’s name. However, Rhaegal seemed happy to have Jon riding him, so perhaps the two siblings are going to have a bit of a tussle over whether Jon is a welcome addition to their family or not… having lost Viserion so recently the pair might be a bit on edge, as is presumably implied by the fact that they’re not eating properly. Poor scaley babies. 2. Is there something between Arya and Gendry? The way Arya looked at Gendry seemed to confirm that she has more than just friendly feelings for the blacksmith. Unlike almost all of Game of Thrones’ characters, we haven’t seen Arya in a romantic situation before, so what comes next is anyone’s guess. Does she push it to one side like Cersei probably would and focus on her duty to her family? Or does she embrace it and explore this soft-hearted side of herself, like Jon probably would? Whatever happens between the two, I really hope it doesn’t have any disastrous consequences - having both an assassin and a blacksmith who creates war-changing weapons distracted could be the last thing Westeros needs right now. 3. What is the dragonglass weapon Arya wants? Arya sure is enigmatic. As Gendry points out, she already has Valyrian steel, but still wants another weapon made of dragonglass. What could it be? We grabbed a still of her sketch, which you can see above, and it looks like it’s a sheathed dagger with some kind of dragonglass spear on one end and a torch to set wights alight on the other. Arya does best when she’s fighting in enclosed spaces, so her plan could be to catch wight stragglers that manage to get into Winterfell. Whatever that weapon is, I don’t want to be on the wrong end of it. 4. What does that White Walker spiral mean? It’s been haunting us since the very first episode of Game of Thrones, and now it’s back. The spiral the Night King makes out of body parts is a recurring motif, and theories range from it being a callback to the God’s Eye where the first White Walker was created, to perhaps it even being a Targaryen sigil. Regardless of what it means, it’s obviously significant to the Night King. As the same design was carved into the walls at Dragonstone, I really hope Tormund mentions the bizarre spiral to Jon so he can make the connection and start to figure out what the Night King is trying to say. Who knows, they might even be able to parley if Westeros knows what the White Walkers want. Ok, maybe not. But we can hope, right? 5. Where are all the other corpses in the Umber stronghold? When Tormund, Beric Dondarrion, and the Night’s Watch entered the Umber stronghold there were loads of bloodstains but a suspicious lack of bodies (apart from Lord Umber who was stabbed into the wall). Thankfully this question has a nice easy answer: the lack of corpses is almost definitely because the dead bodies were reanimated by the White Walkers and strolled away to join the growing undead army. Uh oh. 6. Is Dany going to intimidate Sansa into obeying her? Sometimes Dany is filled with empathy and does what’s right, like freeing hundreds of slaves, and sometimes she says things that are really foreboding. When the Targaryen was talking to Jon she mentioned that Sansa doesn’t like her, looking slightly hurt, before saying “if she doesn’t respect me…” and trailing off. If she doesn’t respect me… she’ll fear me? That seemed to be the gist of what Daenerys is saying, or a much darker interpretation is that Sansa will be a victim of Drogon’s fiery breath if she doesn’t fall in line. The menacing suggestion seemed to shock Jon too. The Starks and Targaryens are almost definitely going to clash in the future, and I dread to think what Daenerys will do to Sansa to retain her control over Westeros. 7. Will Cersei pass off her baby as Euron’s? Cersei caved and let Euron into her bed. Boo. But Euron doesn’t just want to sleep with her, apparently: he also wants to (as he so lovingly put it) “put a prince in [her] belly”. Considering that Cersei is already pregnant with Jaime’s child, this could be a convenient way to keep Euron on her side by passing off her growing pregnancy as being his child. That could make him more loyal, or at least ensure that he has a personal stake in keeping her alive until after the world is over, as with a Greyjoy on the throne Euron can claim the King’s crown while the child grows to maturity. There’s no denying that Cersei isn’t happy about having another man in her bed, though, as her tear-filled eyes showed that she knows she’s gone from one loveless marriage to another. Not gonna lie, I pity her. 8. Will Jon tell Dany he’s her nephew *and* is entitled to the throne? 9. What is Bran going to say to Jaime? My god, that ending to episode 1. Oof. Jaime has seen Bran for the first time since he pushed him out of a window in season 1, and considering how much they’ve both changed since then I don’t even know how their conversation is going to go. Jaime will probably apologise in his own ashamed way, although now that Bran is the Three-Eyed Raven there’s a fairly solid possibility that he’ll think himself above those kind of trivial vendettas. We’ll hopefully get to see it play out in the next episode, so keep those fingers crossed. 10. Is Jon now Rheagal’s dragon rider? For a long time there’s been the theory that the three dragon riders will be Daenerys, Jon, and Tyrion (as fans theorise that Tyrion is half-Targaryen). Viserion might be undead, but it looks like Jon has a bit of a bond with Rhaegal now, and I bet Dany will want company when she goes for her rides on Drogon to scout out enemy positions or simply get away from Winterfell (and Sansa’s contempt) for a while. Having the King and Queen of Westeros enter riding dragons would make for a powerful scene indeed, and mirror the Targaryen’s initial arrival and eventual conquest of Westeros. Sam is in the library researching away like he always does, but one of our biggest Game of Thrones season 8 episode 1 questions is where on earth is his girlfriend Gilly? She accompanied him to Westeros back from the Citadel, and with a baby in tow you’d expect her to be close by Samwell, who she implicitly trusts. Perhaps she’s safely tucked away somewhere. The sound of a crying baby would be incredibly distracting when you’re trying to figure out how to defeat the White Walkers, after all. 12. What were Sansa and Lord Royce talking about on the balcony? Lord Yohn Royce is one of the Starks’ most loyal bannermen, so it’s no surprise that he and Sansa were having a quiet word after the meeting where Sansa was pretty much overruled by Jon and Daenerys. Lord Royce almost would definitely find out what the rest of the Starks’ bannermen think of having a Targaryen for a ruler easier than Sansa, who would doubtless be spotted if she tried to have a discrete word with anyone. It could be that Royce and Sansa are planning a rebellion against Daenerys and Jon, or that Sansa simply wants to know who would be on her side if she were to claim the title of Queen in the North. Whatever they were talking about, they didn’t want Tyrion to overhear - let’s just hope it doesn’t get either one of them thrust into Drogon’s literal line of fire. Those are all of our Game of Thrones season 8 episode 1 questions! Here’s what people thought of the first episode of season 8, or look below to see a recap of what happened in the first episode!